Storytelling is one of the most powerful things we do together as humans. Unsurprisingly, sharing stories on stage can also be incredibly resonant, helping us connect with an audience even though we may not get to meet each member individually. The holiday season always reminds me that storytelling has played a crucial role in many of my most treasured memories with friends and family. Stories can bring a similar sense of intimacy, vulnerability, and personality to any speech – it’s just a matter of sharing the right one. In this episode, I’m sharing some audio from two excellent videos I’ve released previously on the subject of storytelling. The first clip outlines three strategies for using stories in your speaking, giving you some great actionable advice. The second clip is one of my best story-mining exercises, which I use with clients when they feel like they don’t have any good stories to tell. We all have great stories we can share – you just have to get in touch with them! Why sharing stories can be one of the most powerful things we can do on stage. How to start practicing vulnerability in a small group setting to get comfortable with sharing personal stories. Three ways you can integrate stories into your speaking. How sharing a story can help an audience listen to and accept what you’re saying – even if they might not like to hear it. One of my favorite exercises for helping clients sort through their experiences for stories that could be perfect in a talk or presentation. 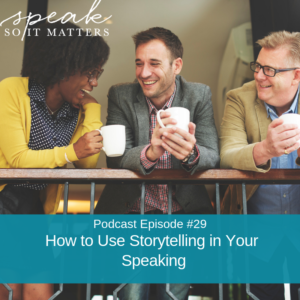 You are listening to the Speak So It Matters podcast Episode number 29. 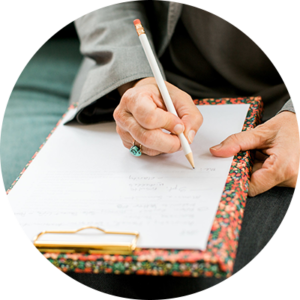 Welcome to Speak So It Matters where we share a mix of stories of inspiration and super practical public speaking and communication guidance to help you release all the barriers to becoming the speaker you know you’re meant to be. Some of us are called to use our voice to serve others and our world as well as to become the most fully expressed version of ourselves. If that’s you, you’ve landed in the right place. Let’s do this, my friends have. Hello, my speaker friends. It is Thanksgiving week here in the United States and I am just feeling so much gratitude, just so grateful for you. It’s such an honor for me that I get to be even a tiny part of the work that you’re doing in the world. I know that you wouldn’t be here if you weren’t on a mission of some kind that makes lives, individual lives and our world a better place and so that I get to be a part of that just feels amazing. Thank you, so much. I’m also thinking a lot about, as I think about Thanksgiving, it makes me think about gathering, gathering with friends, and gathering with family. This past year we did a friendsgiving, so we had a bunch of friends over for Thanksgiving and it was the first time that we had done it that way. We’ve certainly spent Thanksgiving with friends before, but usually, it was a mix of friends and family and it was a really special kind of unique feeling sitting around the table with relatively new friends in the last few years and sharing stories. So many things that we don’t know. So many stories we don’t know about those friends. Even though we were in one another’s lives over the last years, but there’s something about just kind of circling up and sharing those stories that are so cool. I think about that with Thanksgiving. This year we’re heading off to my dad’s house. He lives in a new place. We’ve never been there before. He lived in his last place for more than 20 years and I think about all the stories that have grown there and been told there. Thanksgiving and really the holidays overall and stories feel very intermingled for me, but we are going to get, of course very practical about the story too, so it’s inspiring and exciting, but you know what? Telling stories, it is beautiful for relationship building in all ways and really, especially in speaking, in your public speaking and thought leadership. I was just at a workshop about a week ago and there was a panel, and on this panel, I think there were six people on this panel and it was amazing. We spent about an hour with just each person telling their story and these were successful business owners who were building businesses of meaning. Just as we went along I just noticed how different and unique everyone’s story was. How there were elements of inspiration for those of us in the audience because they were telling those stories in a way that we related to, that was relevant for us. Of course, we choose the stories we tell depending on the audience, right? Within their storytelling, they were focusing a lot on their business growth and some of the struggles. and then some of the victories, because that’s the kind of workshop this was. Well, this is really how you use stories effectively in your speaking. I’m actually going to bring back some previous recordings that I’ve created for different programs and you’re going to hear those across the rest of this podcast. In the first one I talk with you about three ways to use story in your speaking, so you’ll just get some examples of specific ways that you can infuse stories into your speaking so that you make the biggest impact with your audience possible and also reach toward the goals whatever goals you also have for that speaking event. Then in the second clip, you’re going to hear my story mining exercise and this is an exercise I take clients through that is really fun and really powerful cultivator of story. It really is a process of digging in around what stories you have any kind of asking your subconscious to keep giving you more and more stories that you can use in all kinds of thought leadership. In your speaking, in your writing, and everywhere. It’s amazing, once you start asking for stories and looking for stories in your past experience, in your current experience, and you kind of watch for as you go through time, you will be amazed how many you’ll start to collect and be able to use like little tiny micro-stories. Just the perfect little example that’ll help illustrate a point that you want to make. You’ll use it with your client work, you’ll use it everywhere, with your kids, you’ll use it everywhere. The story mining exercise will just get you into that mode and really take you pretty deep into the process. I hope you love both of these. I can’t wait to hear more about your stories. Let’s dive in. Hi there. I’m Michelle Barry Franco and I want to talk with you about how to use stories in your speaking. I’m particularly attuned to the power of story right now because I’m in the middle of facilitating a storytelling challenge. This video isn’t about inviting you to that. In fact, we’re almost finished with the challenge, but I hope you’ll join us next time. Being a part of this challenge right now is making me realize two things about a story in a much deeper way. One, that the very real vulnerable feelings that come with sharing our personal stories. Then number two, the incredible power that story has to inspire an audience to engage them, and inspire them, and serve them. First I want to talk about the vulnerability and then I want to talk about ways to serve your audience through a story, through telling stories. The vulnerability piece I want to share a story of my own. A couple of years ago I had this really poignant moment of realization that I was totally out of integrity in my own work. This came at 3:00 in the morning after a lot of angst over many nights of having difficulty sleeping. What I realized in this morning was that while I was spending my days telling my clients that it was essential that they share their vulnerable stories with their own audiences, that they owed it to their audience to serve in that way, that it was the most powerful way to make an impact, I wasn’t doing that in my own work and my own life. Then, in fact, I was petrified to do that. That morning and that realization, I said to myself, okay, I have to change this. What do I need to do to start telling my own stories? I started a storytelling circle. It’s called Marin Storytelling Circle. It’s been amazing. It’s been two years now, and in that time I have told at least maybe like 20 to 22 of my own personal stories and have really practiced being vulnerable and that’s really what I needed was a practice of being vulnerable. I’ve also gotten to listen to at least 150 stories of others who have come to the circle. It’s been beautiful. I know about those feelings of vulnerability and I also know that we can practice our way into sharing those stories more publicly. All along those last two years, I’ve also increased my own vulnerable storytelling both on stages and online. First of all, the vulnerability piece. Practice yourself through it. The second part, once you’ve done that, how to use these stories strategically. I want to talk about three ways that we can use stories powerfully in our own speaking. One is stories help your audience be more receptive to learning something that they may be resistant to. If you know that your audience is not going to like what you’re about to encourage them to do or try because you know that it will make their lives better. 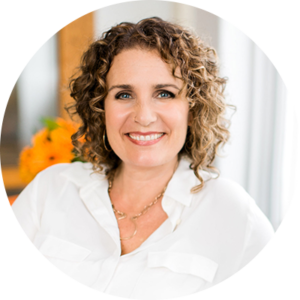 Let’s just say that you’re speaking at a health conference and you know that there’s a good chance that a lot of people in that room who are struggling with their own health and wellness probably have a sensitivity or allergy to gluten or dairy. You’re about to tell them, invite them to try not eating those foods, but you know that their life is probably full of gluten and dairy as many peoples’ are. A story is a powerful way to help them see the path to doing that. How it can actually be joyful, how your story about visiting the gluten-free cupcake place or the vegan bakery down the street from you that doesn’t use dairy, whatever. Story is powerful in that way. Then story also provides such a sense of human connection. It helps us feel less alone. When you choose a story that you know your audience is probably also experiencing something similar and you share it in a way that also shares, that also expresses the feelings they’re probably feeling, you help them feel less alone in those feelings. A story’s a powerful way to say that. You can say you’re not alone, but when you tell a story that shows them, that helps them feel viscerally that they’re not alone, you connect with them in a much more powerful way and help them move forward in their lives through that story. Then finally, a great story can inspire such hope. When you share a story of a time when you failed, when you struggled maybe in a way that they are similarly struggling and you talk about what that felt like, and then what it’s like on the other side you can inspire hope for them. These are three ways that you can use story in your own speaking to serve your audience in a really powerful way. So glad to be here with you today and I’m looking forward to our time together next week. Have a very story filled next week. Take care. All right, so I hope those ideas for ways that you can use stories in your speaking, I hope those ideas serve you as you go craft your next talk. Now let’s dive into that story mining exercise I told you about so that you can actually start cultivating those stories for yourself. If you can grab that big piece of paper and have it ready. Hi there. Today we’re going to talk about storytelling and in particular I’m going to tell you about one of my very favorite tools for pulling out stories from my own experience and from my clients’ experiences because I get told over and over again when I talk about how important and powerful stories are that people tell me regularly I don’t have any stories, I can’t think of any stories, so you won’t have to say that anymore. First let me tell you why you want to do this exercise, why you want to tell these stories, and then secondly I’m going to tell you how to actually do this. First of all, stories, they touch our hearts in ways that nothing else can. We can explain to oblivion how to make chocolate chip cookies, right? We explain the fun of making chocolate chip cookies. We can talk about touching the dough and mixing it with our hands, so we can make it exciting and interesting and lots of different ways, but when we tell that story about when we were six years old and we remember standing on a stool next to our grandmother who smelled like old spice, strangely, since we knew that that was our grandfather’s cologne. When we tell that story and we bring our listeners into that scene with us it touches our listeners in ways that no other explanation can, and so stories are such a powerful way to speak so that others can’t help but listen. That’s why we’re talking about stories. They touch our hearts, but they also help us remember things because later the thing that’s going to help your listeners remember is that picture that you created in their mind. We’re going to talk more about pictures too, right? That picture that you created in their mind for that story so stories are really powerful. They create that emotional connection, but we need to cultivate. We need to actually dig for these stories. We have to tell our brain that we want stories and I have a systematic way for you to do that. Grab a big piece of paper if you can and hang it on a wall. Hang it on a wall somewhere. Look down on this page and you’ll see I’ve created one. I’ve actually, you’ll see a completed story mining exercise there. Ideally, you can get a big piece of paper on the wall. The reason I like big pieces of paper is because adding the kinesthetic movement of moving toward, and moving away, and then moving around the room, which is something I like to do a lot, it loosens up our thinking. If you can do that, great. If you can’t because you want more privacy and you need to keep your process a little more private, or you just don’t have a space for that, or you don’t have big paper, don’t let that stop you. Grab a piece of paper, scratch paper, turn it over and use the back of some handout from your kid’s school or whatever and start this exercise now. You can always get the big piece of paper later for the next time because I know you’re going to use this over and over again. Here’s how you do it. You need a couple of things. First, you need, what is your, what is this piece of communication about? What is your speech about? Let’s say your speech is about how to have more confidence. Okay. That’s your purpose for your speech is you are going to teach your audience how to have more confidence. Okay, so I’d probably want to tell some stories about how I became more confident over the years. Of course, I can think of ones that are more recent maybe, but what can be really powerful is to tell ones that’ll surprise and delight them from way back when you first started stepping into a more confident way of living, let’s say. You’re going to write how to have more confidence at the top of the page so that you remember what this is about. Then you’re going to pick a person, a place, or a phase of time in your life. Okay? I like to pick my grandma. It’s just kind of a common one I start with because I have a lot of stories related to my grandma. I might, I’ll put grandma on that little sheet of paper and you’ll see down on this example that’s on this page how that’s been done. This is mind mapping from here, right? You put grandma in the middle. Okay, grandma. What are some stories from my experience with grandma over the years that have to do with confidence? You’re just going to ask for it. You ask, you ask the universe, ask the divine, however you like to think about that. Ask your grandma here for a story about this and you’ll find that when you think of your grandma and you think of confidence a story will show up. For me, I have the one that comes up for me right now about when my grandmother met my grandfather at the skating rink. I remember her telling me this story and so this happens to be a story that my grandmother told me about a time when she exerted her confidence when she didn’t think she had any. Okay, so there’s one, and then you’ll say, okay, what else from grandma? Gosh, I remember the time I was sitting at the kitchen table when I was about 11 and my grandmother was telling me how to respond to a friend who was giving me a really hard time. He was being mean. There’s another story. Then you just keep doing that. Okay. What else about grandma? Let any story come to you and just write it down. Right now is not a time for judgment. It’s just a time for tracking. Okay, and let it build on itself. Then once you’ve finished with that you might choose a phase of time. All right, I’m going to go to college and you write college, or you might even write your college in the center if that helps you get even more, the more specific you are the more easily the stories will visit. You could put the dorms at college and then you put yourself even more clearly there in the dorms at college. Okay, what did I learn about confidence in the dorms at college? Okay, and you’re going to go through that exercise. Then when you’re finished with that one you’ve done a place, you’ve done a person, so why don’t you try on a phase of time. You can see how you could also call college a phase of time. Right? This isn’t about being, it isn’t about sort of concretely defining what each of these means. We’re just using these as tools, as avenues into the stories that exist. A phase of time could be when I first got married, what did I learn about confidence when I first got married? You’re putting that circle on that page. When I first got married and what are some of the stories that come to me about when I first got married? I think about my wedding and how I had to learn how to say what I wanted to my parents who also had views on what they wanted. This is a way, and you will notice that when you start asking when you start asking your brain, the universe, the divine, however you want to think about it, all of them for stories, the stories will start to come more and more. When you create a practice around this you will start having stories arrive on scene when you’re not in the middle of this exercise because you have told your brain I am looking for stories and your brain goes to work. It’s amazing like that. Okay, so you can see the instructions down here. They’re listed out a little more linearly and you can reference them as you go through the process if you get stuck on anything. All right, find your stories and then if you want to speak so they can’t help but listen, use stories. Use them strategically, always related to, of course, the point you want to make and always stories that will resonate with this particular audience, which of course you are well acquainted with because you have gone through module one where you really dig in on who they are, and what they need, and want. Then you can tell them stories that will delight them, that will light them up, that will really engage them, captivate them. Okay, I’ll see you in the next module. Have fun with this. I can’t wait to hear how it goes. Take good care. All right, my friends. I hope that this process helps you just dive deep into the archives and to the beautiful, gorgeous treasure chest of the stories in your own experience and really kind of creates that heightened awareness as you go into whatever experiences you have coming in the weeks and months to come so that you really notice when a remarkable story is something you want to mark and maybe even write down, put it on a little sticky note, put it into a folder, whatever, and just really start concentrating on and gathering these stories. They are going to serve your relationships, your connections, and your thought leadership and public speaking so much. You know how much I love to help you get out there in really practical ways. I want to help you step into the leadership speaker you’re supposed to be and I want to help you do that from a mindset and heart set perspective, and a very practical perspective too, which is why I created the Get Started Speaking Guide that you can get at SpeakSoItMatters.com/yes. As you know, inside that Get Started Speaking Guide is the only presentation outline you’ll ever need, which is like gold. I hear that from people over, and over, and over again. Plus many other tools, just really practical tools that help you analyze your audience and just decide where you should be speaking and track your outreach, right, so that you can get out there and make that difference that you so want to make. You’ll find that guide at SpeakSoItMatters.com/yes. In the meantime, my friend, it is once again such an honor to be here with you. You know that I love being here and I’m over here cheering you on all the time because you were made for this and you know that I know that because you know. All right, see you here next week. Thanks for listening to this episode of Speak So It Matters podcast. If what you heard here today was useful you’ll love the free guide I’ve created for you at SpeakSoItMatters.com/yes. Not only will you get immediate access to our power and grace speakers toolkit, including the only presentation outline you’ll ever need, but you’ll also receive weekly updates with our best resources as they’re created. I can’t wait to see you out there shining your beautiful light and changing lives with your message.